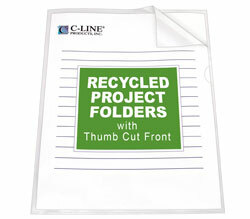 Strong, tear-resistant recycled* polypropylene folders divide and organize your many projects. *This product contains at least 70% material diverted from the solid waste stream and meets the FTC definition of recycled. It may not meet your state’s definition of recycled. Disclaimer Statement(s): This product contains at least 70% material diverted from the solid waste stream and meets the FTC definition of recycled. It may not meet your state’s definition of recycled.